This November, join the UIP Companies as we raise awareness and fight against hunger and homelessness in the Washington DC area. 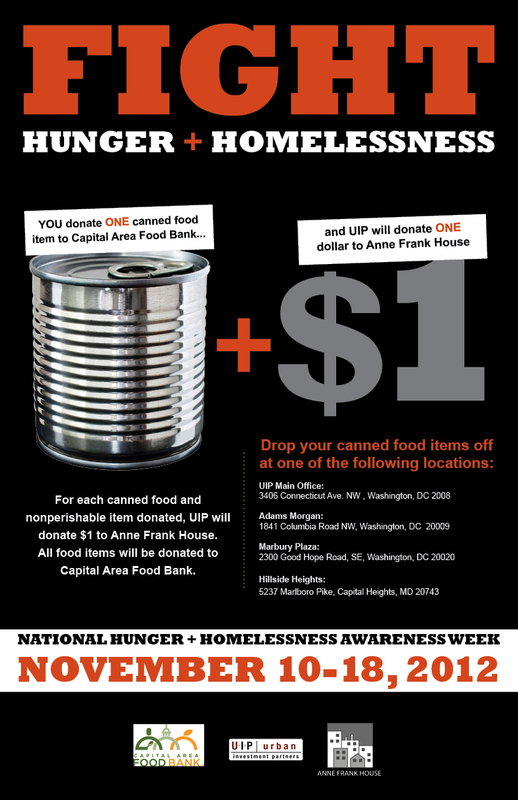 UIP will donate $1 to The Anne Frank House (AFH) for every canned food item donated at a UIP participating location. The Anne Frank House is an organization that provides housing and social services to women and men with chronic mental illness. All food items will be donated to the Capital Area Food Bank. Canned Food Items: Canned fruit, vegetables or protein. Canned soup, chili or stew. Grains: Multi-grain cereal, oatmeal, brown rice, white rice, quinoa, couscous or pasta. Baking Goods: Boxed mixes (brownie mix, cake mix), flour, baking soda, sugar and spices. Snack Foods: Dried fruit, nuts, popcorn, pretzels, granola bars, crackers, etc. To learn more about Anne Frank house, click here. To learn more about the Capital Area Food Bank, click here.